....or are you just happy to see me? My Wienermobile has a first name, it's O-S-C-A-R.
Photo Copyright 2009 Prototype Source Inc.
A couple of times while traveling the roadways of the U.S., Tom and I have happened across the Oscar Mayer Wienermobile. The Wienermobile has been around for seventy years--that's twice as long as me! Or five times as long as me, if you're measuring space and not my creative sense of time. The Wienermobile is driven by Hotdoggers, recently graduated college students who tour it around the country for a year. Dan Duff, a Hotdogger alum, shares an incident with Jon Stewart and the Wienermobile here. You can get a virtual tour of the Wienermobile on this site, and you can follow it on Twitter at http://twitter.com/wienermobile. 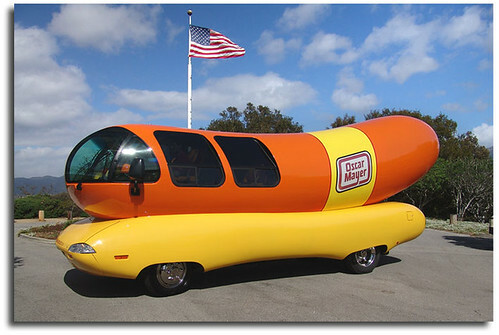 Hawaii wants the Wienermobile banned in their state because of a law forbidding advertising on billboards and vehicles. I personally think the Aloha State is in a conspiracy with Armour Hot Dogs and those big kids, little kids, and kids who climb on rocks.